As new parent your main responsibility is looking after your baby, but life and chores don't stop. You need a solution for a way to keep your little one happy and entertained, and also safe and comfortable, when you need to get some cleaning done, cook a meal, catch up on paperwork, or simply need a rest yourself. Any guilt caused by not being engaged with your baby is completely alleviated by having a fun solution! The way to achieve this is with play mats, play gyms, rockers and bouncers - depending on the age and mobility of your baby they will progress through these options. And, these types of toys and play aids have all sorts of other benefits too - be they stimulating and soothing, strengthening and developing muscles, or teaching new skills. 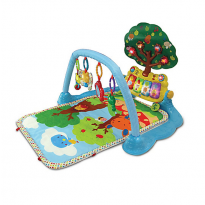 You will find the best reviews and prices for all the toys you need in ConsoBaby.